The morning glow raises its bright head upon the sakura-filled skies and skyscrapers of Mitakihara Town, British Columbia, now the second-largest city in Canada behind Toronto and the largest in the province. The city streets are paved with cherry blossoms petals meshed in with fresh snow from a recent flurry via the Inside Passage in Alaska. The outdoor skating rinks are full of tourists and regulars who fancy a little exercise, and the sport shops are full of Vancouver Canucks logo merchandise and Mitakihara Town Sports Club apparel. Fresh mochi can be purchased at a number of restaurants for breakfast, and a new type of bun has taken all of Canada hostage: the poutine bun, which is a steamed brown rice flour bun filled with rich, steamy poutine. Young men and women with dreams of making it rich and being successful walk to school carrying suitcases of books and binders to the many primary and secondary schools in the city. At Mitakihara Harbour, the local fish market is bustling with the latest catches of the day, and the ferries are carrying people across the Strait of Georgia to the Lower Mainland, perhaps to head to Vancouver, or eastward to other parts of the country beyond the Rockies via the Trans-Canada Highway. The statues of Dr. Madoka Kaname and Dr. Homura Akemi in their goddess forms welcom visitors and students at the main entrance of Mitakihara University, a young institution that has grown in leaps and bounds over a short period of time. On campus, the historic MetroTech Shanarena is busy, as it is hockey season. The Puella Magi women's ice hockey team have been given the day off, making way for the Frozen Thunder, the Magi men's ice hockey team, who are under a new coach in Chris Norwood, a former defenseman for the Magi and also for four different NHL teams over a career of 18 years which include three Stanley Cups. The practices are intense, to match the play of a team accustomed to high-intensity play with a bruising, physical touch. At the morning skate, which is a magnet for interested press members and scouts, an unusual face observes the up-and-down drills on the rink. Despite all of the arguments that no one team is better than the other at Mitakihara, all roads lead to the football team. Quarterback Ricky Cojuangco, known to all as the one and only "Rico Football," likes his ice hockey too. But why? How can a Filipino-Canadian used to playing gridiron fall in love with the sport of ice hockey? "I watched Hockey Night In Canada ever since I was one year old," Cojuangco explained. "My team in the NHL is Vancouver, but I have a soft side for the Canadiens because they still have more Stanley Cups than anyone out there. Last season, the Canucks did win their first Stanley Cup in forever, so I go for Vancouver anyway because they're the home team. "But our university ice hockey teams are good too. It's a place where I call home. I know. I believe. I like how our students do what the European teams do, and that's sing, chant and jump from start to finish. It's always loud at the Shanarena. You can't even hear yourself. It's great home ice advantage, and the boys lose very few games at the Shanarena. It's that deafening. "I think our ice hockey teams want to be as good as us. They want to be the stars of the Athletic Department, so there's always an intramurals competition between the football team and other men's teams as to who is more talented all-around. Naturally, we prevail in the end, although the ice hockey guys always say we're cheating or it's rigged. We don't care, we win fair and square, that's all there is to it." Cojuangco's frequent visits to the Shanarena inspired his band, Kaname Hall, to compose their next album, entitled "Morning Skate." It's a sudden change from their roots as a band that plays OPM music and a chance for them to explore what they are truly capable of as a band. "Yeah, it's a complete sea change. So we produced the album during our off days, and we finished it this week," said Cojuangco. "There's a lot of hockey-themed songs, as well as some other covers and non-hockey numbers. I think the fans are gonna like what we dish out there. It will also be our first album where the songs are mostly in English. There's a few French songs, too. "Our favorite track in this album is 'Hunter of Stars,' which is a cover of a song by a Swiss guy named SeBAlter. The original recording didn't look right, so we gave it a ska flavor, reminiscent of Reel Big Fish, a band that friends of my grandparents used to listen to. Funny story about this album: after mixing finished: Dr. Akemi comes in to the studio and compliments us on finishing the album. She listens to it, and she says, 'I'm buying the first 50 copies.' I say to her, 'Just go to your iPad, go to iTunes, and order away, easy. You can buy 500 if you want. It's all cash to us.' Funny situation, that." 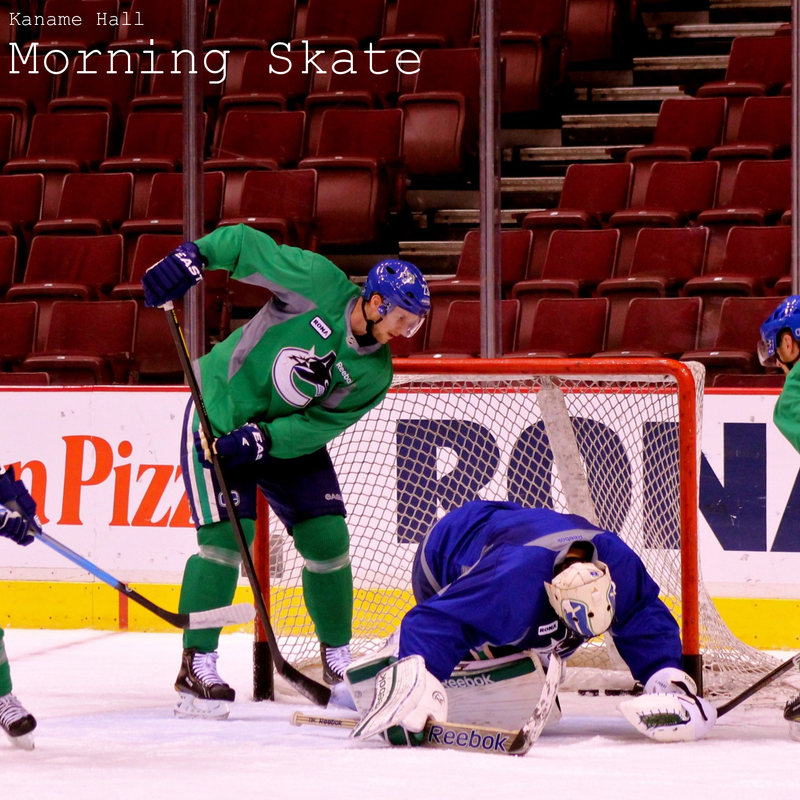 "Morning Skate" is out on iTunes for $10.99 CAN.